Shifting Baselines explores the real-world implications of a groundbreaking idea: we must understand the oceans of the past to protect the oceans of the future. In 1995, acclaimed marine biologist Daniel Pauly coined the term "shifting baselines" to describe a phenomenon of lowered expectations, in which each generation regards a progressively poorer natural world as normal. This seminal volume expands on Pauly's work, showing how skewed visions of the past have led to disastrous marine policies and why historical perspective is critical to revitalize fisheries and ecosystems. Edited by marine ecologists Jeremy Jackson and Enric Sala, and historian Karen Alexander, the book brings together knowledge from disparate disciplines to paint a more realistic picture of past fisheries. The authors use case studies on the cod fishery and the connection between sardine and anchovy populations, among others, to explain various methods for studying historic trends and the intricate relationships between species. Subsequent chapters offer recommendations about both specific research methods and effective management. This practical information is framed by inspiring essays by Carl Safina and Randy Olson on a personal experience of shifting baselines and the importance of human stories in describing this phenomenon to a broad public. While each contributor brings a different expertise to bear, all agree on the importance of historical perspective for effective fisheries management. Readers, from students to professionals, will benefit enormously from this informed hindsight. "Only by opening our minds to the past can we truly see and understand what humans have done to the natural world. Shifting Baselines is a poignant expos é of this fundamental yet sadly underappreciated truth, made both rigorous and credible through the skillful melding of traditional and natural history. A must read for everyone who cares about the status of fisheries, the state of our oceans, and the ideal of sustainability." "What exactly are marine conservationists trying to conserve? Most would answer 'nature.' But this important book—an innovative collaboration between scientists and historians—shows us that the current state of nature is not natural at all. On the contrary, it is profoundly depleted, the result of 300 years of intense human predation and pollution. If we continue on our present course, we shall 'manage' our fisheries to extinction." Naomi Oreskes, author of "Merchants of Doubt"
"In this book, Jackson and contributors illustrate how appreciation of historical baselines in marine ecosystems demands fundamental revisions of restoration goals for ocean resources and inclusion in ecosystem-based management schemes for fishes. This approach holds promise of transforming the science of sustainability." 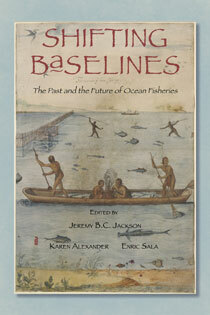 "Twenty-six international scientists and historians contribute 11 chapters exploring the 'shifting baselines' paradigm—how each generation regards a progressively poorer natural world as normal—as it applies to current perceptions of the world's oceans and the future of ocean fisheries. " "Given the diverse backgrounds of the contributors, this book gives a wide view of what the past means for the future: what cod populations really looked like, how to detect genetic bottlenecks (for instance, a population of 100 female whales loses 0.5 percent of its genetic variation every generation), why we need to write communication into scientific budgets. Editors Jeremy Jackson, Karen Alexander, and Enric Sala have tied all the threads together (full disclosure: they are friends and colleagues, as are many of the chapter authors)." "[Shifting Baselines] provides a unique historical perspective on the evolution of knowledge and scientific thinking around shifting baselines...Book is a great effort by the editors and their team of authors, and it makes for compelling reading." "Contributors present an analysis of historical data on the impacts of humans on marine systems, and address the need to understand the past to help predict the future. The essays are presented in a clear, logical manner..."
"Ecologists and historians, in an all-too-rare collaboration, combine their perspectives to explore the significance of the shifting-baselines paradigm in a set of studies that cover most of the world's major oceans." "Shifting Baselines is refreshing intellectually in its willingness to bring together fisheries science and history to impose new questions on the development of the marine environment and the exploitation of the fisheries." "Shifting Baselines is a stimulating and necessary volume for anyone interested in the issues surrounding marine conservation, ecosystem-based management, or how societies may set ambitious but realistic targets for biodiversity."